So, this week has been thoroughly miserable here in the UK, storms, grey skies and cold northerly winds...I am embarassed to admit we had the fire on several nights. In order to warm things up I thought I would work on a watermelon spread. Watermelons are not such a `thing` in the UK as they appear to be in the US. However, I am fascinated with the colours. When this scrappers delight image came up on special offer I thought it is time to give it a go. This time the main image has been coloured using Polychromos pencils. I usually like to use my alcohol pens but colouring in front of the telly is so much easier with pencils. We have been binge watching series 3 of The Black List this week and I have the two final shows to watch tonight. I am so hoping they are a little more positive than the sad ones I have been watching. Anyway, I digress...time to get back on topic. I have been hearing a lot of good things about Prisma Color pencils and am currently debating with myself...Do I really need more pencils? What do you guys think? The image as usual has been coloured on sticker paper, fussy cut and applied to a background that has been sponged on with some cheap pigment ink...so cheap it doesn`t even have a name. The little squares were stencilled on to give a little texture. The washi is Watermelon from Lora Bailora. I really like her tapes especially these fruity ones, I feel an order for some more coming on. 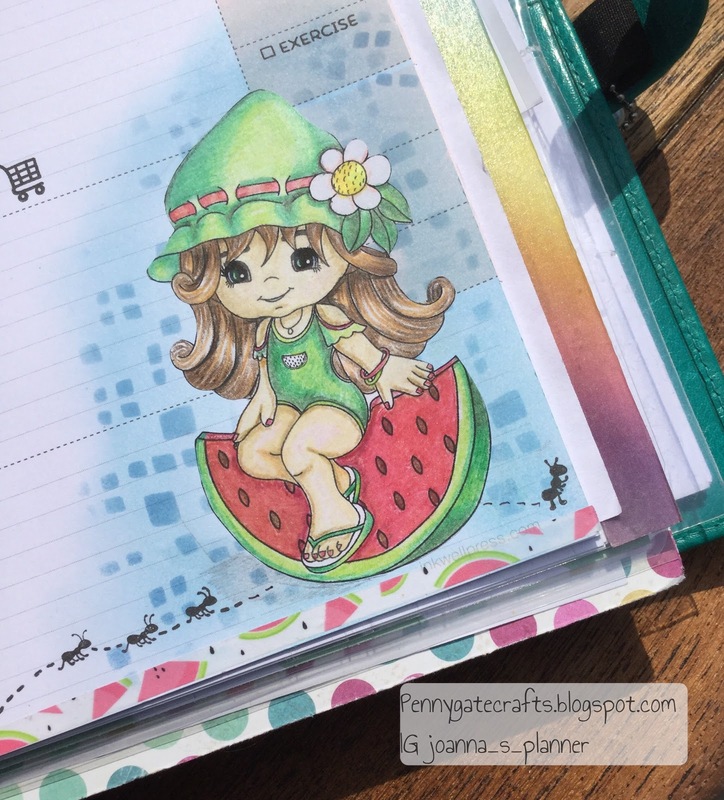 I have used the lawn fawn ants on the bottom of the spread and the watermelons from the same set as an extra decoration (yes, they are alcohol markers). I love them, think they look great but I do think I could have stamped the ants more neatly. 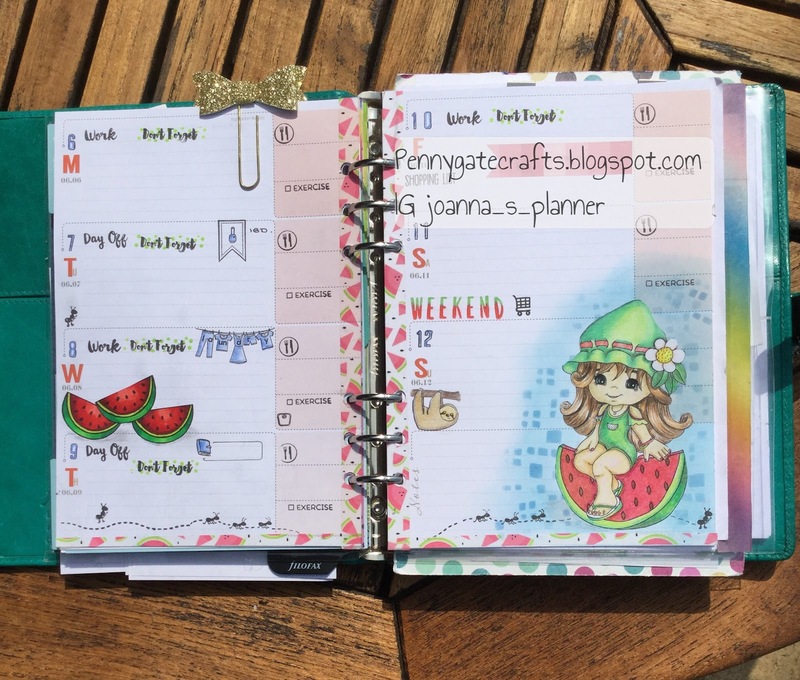 My Sloth on Sunday is making another appearance courtesy of Tiny Stamps Big Plans. 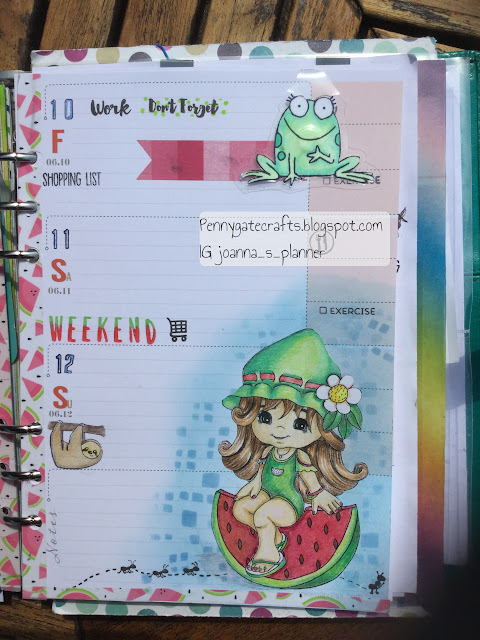 Functional stamps this week are from my two favourite stamp companies Studio L2E and Tiny Stamps Big Plans. My page flag though, is a Project Life stamp from Stampin` Up. 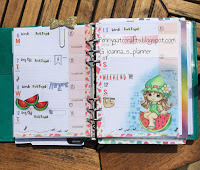 I demo for Stampin` Up and find these my most useful stamps as far as planners are concerned. I love my ombre weekend made from the the tall skinny letters by studio L2e ...I finally managed to get them straight, they are actually quite easy to work with but I am what they call cack handed (UK speak). Consideration is being given to permanently mounting them to a block. Rowena at Tiny Stamps Big Plans is currently considering options for another custom order. My `work` and `day off `stamps were part of the last custom order. The quality is super and they are ideal if you don`t want to design a whole sheet. I am actually using my custom stamps now on a regular basis but I do want a few more. This looks great as usual, Jo! This water melon themed stamps are so cute. Thanks for telling about these stamps vendors so that we can also buy these cute stamps from them!